Make this your lucky weekend with 100 free spins on the new Pig Winner slot from Uptown Aces Casino! 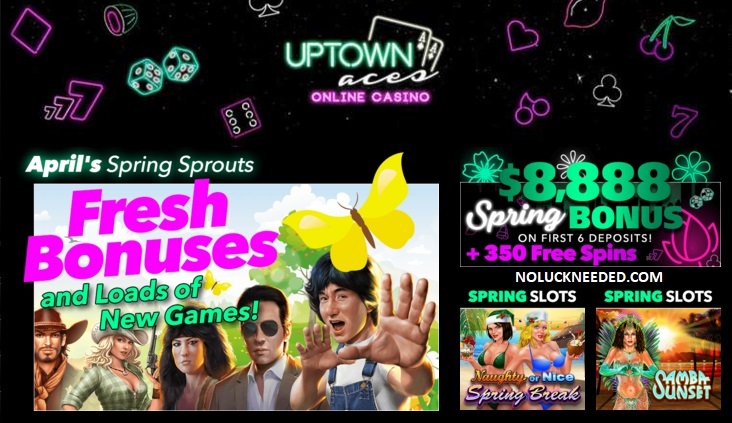 Redeem the coupon code LOVEWKNDUPTOWN to claim your free spins and win up too $500 if your account qualifies and your last transaction was a completed deposit on Friday or Saturday at Uptown.Good luck! $10 Free Chip for New Players: Register a new account at Uptown Aces Casino after clicking the banner below redeem noluckneeded.com's exclusive no deposit bonus code UPTOWN10 to claim a $10 free chip! Game: Pig Winner; Weekly rewards hold 40x slots playthrough and $500 max cashout. Do not claim 2 free bonuses in a row. Max bet rule applies. Standard terms apply. Listed in message center as of 4/12/19. Valid Once a week Friday, Saturday, Sunday. $25 minimum deposit. 35x slots wagering. No Maximum cashout! Weekly rewards hold 40x slots playthrough and $500 max cashout. Do not claim 2 free bonuses in a row. Max bet rule applies. Standard terms apply. Listed in message center as of 4/3/19. No Maximum cashout! $25 minimum deposit. $1000 maximum deposit. Standard bonus rules apply. Redeem the coupon code in the casino cashier's coupon section BEFORE making your first deposit. Bonus money is not cashable. Claim Your April Free Chips at Uptown Aces Casino! Uptown Aces Casino is a Real Time Gaming online casino and a proud member of the award-winning Deckmedia (SlotoCash) Casino group. UptownAces is a noluckneeded.com certified and recommended casino due to their long history of good customer service and reliable player payments. Bitcoin is now accepted for deposits and withdrawals at Uptown Aces Casino. Click here to read and share Uptown Aces Casino reviews, ratings, or complaints..
Players from the following countries do not qualify for free no deposit bonuses: Albania, Armenia, Azerbaijan, Belarus, Bosnia and Herzegovina, Bulgaria, Croatia, Hungary, Kazakhstan, Kyrgyzstan, Latvia, Lithuania, Macedonia, Moldova, Montenegro, Poland, Romania, Russia, Slovakia, Slovenia, Tajikistan, Turkmenistan, United Kingdom, Ukraine, Uzbekistan. 150% for all games 30-60x wagering; $30 minimum deposit. CLEO2019 can only be redeemed after using the 150% bonus. $500 maximum cashout. Spins Game: Cleopatra's Gold. Valid 4/12/19 until expiration date unknown.